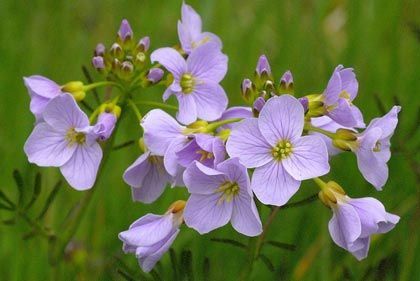 This is a hairless perennial which tends to favour wet habitats such as marshes and damp meadows. 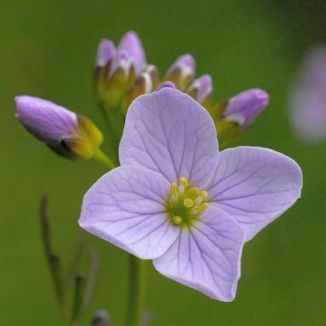 It is also known as 'Lady's Smock' as the flower was said to resemble a milkmaid's smock. Its 12-20mm flowers have four broad, overlapping, lilac-pink, pink or white petals and appear in April, lasting until June. It has broad root leaves in a loose rosette while its stem leaves are narrow with numerous leaflets. Its seeds are contained in elongated, smooth, ascending siliquas. It is a larval foodplant of the Orange-tip butterfly. It is a native plant and belongs to the large family Brassicaceae. I first identified this plant in 1976 in Roundwood, Co Wicklow and photographed it in Laragh, Co Wicklow in 1988 and Gibletstown, Co Wexford in 2006.